This magnificent fresco portraying the betrayal of Jesus, was painted by Giotto over 700 years ago in the Scrovegni Chapel in Padua, Italy. 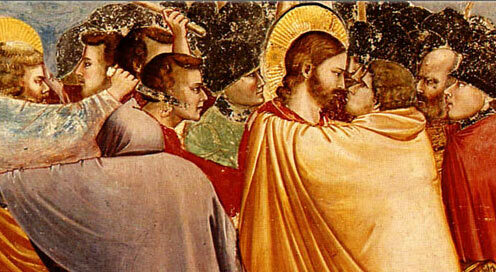 Giotto portrays Judas thick browed, eyes deep set and dark, almost Neolithic. Christ’s face is alive: living, breathing, grieving, hurting. Yet we see Christ’s forgiveness and sorrow for Judas and the enormity of his deed…the Judas kiss, the kiss of betrayal. It was astonishing that Mary Cassatt (1849-1926), could capture these images as she herself eschewed marriage and a family of her own. Take a look at this video and you will see why Burt Lancaster and Deborah Kerr made movie history! Click here if you are unable to view the video. I loved this one…the Kiss! Just terrific! Great, especially the From Here to Eternity. That is an all time classic. Although Gioto’s Judas looks like he’s about to slap a great big smack right on Jesus’ lips, Mary Cassatt’s mother looks like she’ll just ponder her situation a bit before getting down to such a serious matter. Deborah and Burt have cast their inhibitions to the winds (the sea? ), and have literally embraced eternity as they clutch one another. Thank you, Kirby, for pointing out three poignant masterpieces of passion. Your comments are always incisive, David. These comments gave me a good laugh. It is amazing to me the unique examples of the “kiss” are so capably woven together. The video was a superb link to the theme. What a perfectly wonderful way to start my day!!! I do hope to get to the Broad next week when I am with my daughter in LA! If not, it is a must for my next visit. Also loved the mother and child paintings! Nothing ever so amazing and loving. 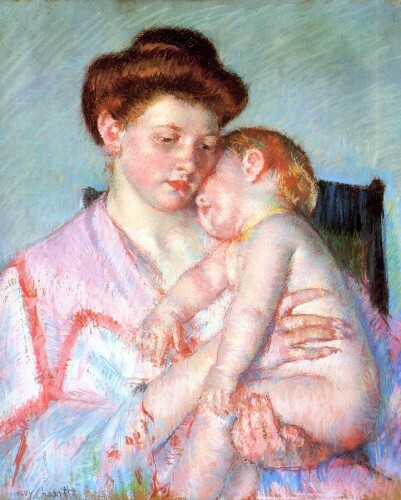 (Mary Cassatt at her finest!) The love scene also emotionally charged. The kiss is a means of communication. It is a greeting. It is a means of expressing affection. It is a sign of respect. It can be a sinister signal. It can be deceitful. Examples thru the history of man illustrate if a variety of forms. But stop. Think. Whatever the intent. What ever the purpose. It is communication. In its self it neither good or bad. And so forth. Its role in art illustrates its communication role so well. I hope I conqured the CAPTCHA Code.